We offer high grade, hardened steel meat grinder replacement plates for most grinders. Available plate styles include Cleveland, Enterprise, and Toledo. 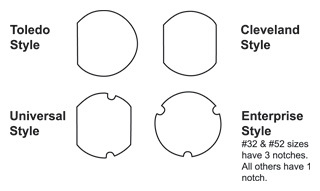 To order grinder plates, first determine the style of your grinder; Cleveland, Enterprise, or Toledo from the chart below. Next determine the cutting group size; #10/ 12, #22, #32, #52, #56. Select the appropriate plate category to view plates for your grinder.